One of the best parts of my job as a Farm to School Regional Lead for the USDA’s Food and Nutrition Service is visiting schools and districts that are bringing local foods into the cafeteria and teaching students where their food comes from. And I am always particularly excited when I get to visit programs with innovative school garden components, like William Penn High School, part of Delaware’s Colonial School District. Several years ago, William Penn went through a major restructure. Part of what came out of that process was a renewed commitment to agricultural education, and the recognition that the 117-acre William Penn Historic Farm, operated by a local land trust, could be a major asset to the school. 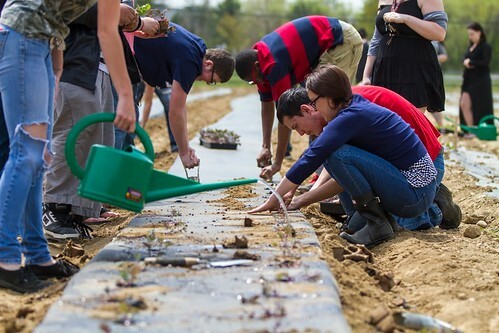 A new agriculture “major” was established, and students took over two acres of the adjacent parcel to grow more than 30 varieties of fruits and vegetables. They also started a CSA program selling shares to teachers and community members. To significantly increase production output on the high school’s farm, Colonial School District applied for and was awarded a USDA Farm to School Grant for fiscal year 2015. They hoped to eventually produce enough food to become a regular supplier of produce to Colonial’s Nutrition Services Department. This year, with grant support, the students brought an additional two acres into production, and they plan to continue to expand their acreage. To extend the local growing season and preserve the peak harvest, they are also purchasing hoop houses and blast freezing and canning equipment for the farm’s products. In addition to fruits and vegetables, the students raise broiler chickens that they sell to the culinary program at the school. Soon, they will plant grasses on an additional nine acres to raise ruminants for an animal science program. On the day I visited, the student farmers had just harvested 30 pounds of lettuce, which was mixed with kale sourced from a local farm, tossed with a honey vinaigrette, and served as part of lunch. As I helped them plant four long rows of three different varieties of kale, the students talked about what a difference the farm and their agriculture teacher, Kathleen Pickard, has made in their lives. Several of them are even planning to pursue careers in agriculture; their first paid positions as farmers could begin as early as this summer, when the district will be hiring for several part-time positions to keep the farm thriving and productive. Some students spend as many as two class periods a day on the farm, and the science focused curricula is integrated into their grade level standards. Most of the students who work on the farm are also members of the reinvigorated Future Farmers of America chapter at William Penn connecting them to a national network of agriculture professionals. The mission of the farm is to serve as a resource for sustainable farming, conservation and healthy communities. Speaking with the students, their faces beaming with pride as they relayed stories of the first delivery to the cafeteria and their excitement around crop rotation and agriculture education, I couldn’t help but think that they are a community; growing more than great food, growing pride and a legacy of health. Great to see this high school farm highlighted! Gaining an appreciation of the work it takes to grow food, learning about the environment, increased physical activity, eating fresh vegetables, and taking pride in one's work are just a few of the benefits gained from student engagement in farms and gardens.